Online gambling operators are constantly on the lookout for new ways to conduct payments with bettors who either have no credit/debit cards or are reluctant to use them for gambling purposes on the internet. 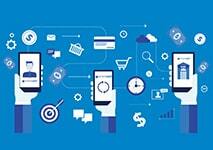 Many fintech companies have already produced alternative solutions in the form of third-party online banking processors that are easy and safe to use. One such internet banking system is called Entercash. 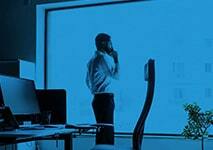 This is a Malta-based company, founded back in 2011 by an expert in the field of online brokerage firms establishment. Entercash markets itself to various European countries but is on a mission toward further expansion in more jurisdictions. 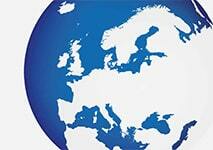 The company presently operates a network that spans more than 4,300 banks in over 18 European countries. It boasts an impressive customer base consisting of over 100 million users, including many online casino players and sports bettors. The beginning of 2019 saw Entercash’ acquisition by Trustly. The latter is an established fintech company that hails from Sweden and is responsible for the provision of online banking solutions to customers in more than 29 European markets. No details regarding the purchase price were revealed when the deal was announced but as of October 2018, shareholder yearly reports evaluated Entercash at SEK340 million. In essence, Entercash facilitates simple, convenient, and exceptionally secure payments between casino operators and their customers. It serves as a direct real-time bridge between players and their banking institutions. Stay with us to learn how Entercash works and how to use it as a payment method at online casinos. Create account/Sign up for account No registration for Entercash is required. Entercash is basically a direct online banking platform that connects players with their virtual casinos of choice without forcing them to reveal any of their sensitive credit card information. It works in the same manner as other internet banking processors, such as Euteller, Giropay, and Trustly. The payments with Entercash are conducted in real time straight from the player’s personal bank account. The role of Entercash in the whole process is simply that of a mediator between the player and the banking institution they hold an account at. Respectively, one needs to open a consumer account at one of the banks within the Entercash network and sign up for its online banking services. The procedure is hassle-free but you might need to visit the bank in person to open your account there. There is no need to register a separate account for Entercash, though, which makes paying with this solution all the more convenient. One of the biggest strengths of Entercash is that it provides casino players and other consumers with a convenient interface and a simple authentication process that uses their existing online banking log-in credentials. The Entercash network boasts coverage of over 4,300 banks in 18 countries, with a focus that falls mainly on the Nordic markets. The fintech company states on its official website that it launches its services on a new market only if it has succeeded in covering a minimum of 80% of the banks in the corresponding country. Some of the countries where Entercash is available include Finland, Norway, Sweden, Germany, the Czech Republic, Austria, the Netherlands, Lithuania, and Estonia. The banks that are part of the constantly expanding Entercash network naturally differ between countries. Some of the banking institutions within the Entercash network are Danske Bank, Handelsbanken, Alandsbanken, Swedbank, Skandiabanken, UniCredit Bank, and Raiffeisen Bank. Entercash offers an interface most people who have used online banking are well familiar with. When depositing at your chosen online casino, you are practically using the interface of your bank. Entercash poses simply like a bridge that allows you to conduct the transfer anonymously. In order to deposit with this solution, you first need to visit one of the numerous online casinos that support Entercash as a payment option. You find the Entercash logo in the cashier menu and enter the sum you want to transfer to your casino balance. Most gambling sites require you to select the bank from which you are transferring the money. You can do so from a drop-down menu containing some of the supported financial institutions within the Entercash network. Then you submit your deposit request and the casino’s cashier transfers you to the website of your bank where you can access your online banking account with your existing log-in details. You may have to select your preferred payment account. You confirm all the relevant details to authorize the payment and are good to go. Depending on the financial institution, you may be prompted to provide a confirmation code. You submit the payment after filling in all the requested information and the funds are instantly added to your casino balance, enabling you to start playing immediately. Some online casinos working with Entercash do not process withdrawals with this method. Others may support withdrawals but list them under the Bank Withdrawals tab in their cashiers. If supported, the withdrawal procedure with Entercash coincides with the process you go through when depositing with the method. Moreover, when you attempt to cash out with this method, some casinos might require you to submit documentation as proof of payment. The purpose is to authenticate you are indeed the holder of your online banking account, which prevents illicit practices like money laundering. The verification entails the player sending a screenshot of their online banking account where the name of the account holder and the account’s number are clearly visible. Some casinos may ask you for a copy of a bank statement. The name of the Entercash-associated bank and your own name must be legible. That being said, there are but a handful of gambling sites that support the method for both deposits and withdrawals. If possible, withdrawals with Entercash are not immediate like the deposits. Each withdrawal request needs to undergo verification on behalf of the casino first. This usually takes between 24 and 72 hours. The exact processing timeframe depends on the operator you are gambling with. The good thing about Entercash is that the payment system itself does not charge additional fees for processing players’ payments to and from online casinos. Most gambling sites using this banking solution are also not in the habit of imposing processing fees on players. However, casino buffs who use the method may incur extra charges on behalf of the financial institutions they hold accounts with. Many of the associated banks do not charge their customers extra for using their online banking interface. The charges you might incur, if any, would vary depending on the bank whose services you are using. Entercash caters to consumers from European countries, with a focus on main markets like Austria, Germany, Finland, Estonia, Sweden, Lithuania, Estonia, Latvia, and the Czech Republic. Respectively, when you use it for online payments, the transactions are settled in your country’s local currency. This would be the EUR for those who live in jurisdictions that are part of the European Union. Other than that, the payment system supports three processing currencies – EUR, CZK, and SEK. The deposit and withdrawal limits depend on which Entercash casino you are gambling with. The transaction limits imposed by Entercash itself vary between countries. For example, consumers from Germany and Austria must comply with a limit of €5,000 per transfer while those based in Finland, Latvia, and Estonia have a higher transaction ceiling of €10,000. Swedes who use this internet banking portal can make online payments of up to SEK100,000 (which corresponds to around €10,000). An increasing number of online casino players from Europe pick Entercash as their preferred payment method. This interest can be attributed to the exceptional levels of security the online banking platform offers. Entercash conforms to the highest standards of security in the financial industry and uses high-level SSL encryptions to ensure payments through its platform are always safe. In fact, the same can be said about most online casinos working with this method. The operators also encrypt all transactions to keep them secure and private. No banking information is ever disclosed, or at least not when you are gambling at a reputable casino that operates under a valid license from a respected regulator. Speaking of regulators, Entercash is also subject to supervision and regulations on behalf of Malta’s Financial Services Authority, or MFSA, under the provisions of the Financial Institutions Act of 1994. Another layer of safety is added by the fact Entercash is merely a bridge between banks, yours and that of the online casino you play at. There is no need to disclose sensitive information about credit card numbers when you initiate a casino payment with Entercash. All details concerning the money transfer are kept safe between you and your bank. Casino players who have any queries, issues, and complaints regarding Entercash can address them by contacting the payment company’s support team. Regrettably, there is no way for you to reach them via live chat. At the moment of writing, the only means of communication between consumers and Entercash is email at contact@entercash.com but there is also a contact form on the website. You need to input your name, your email address, your bank’s name, the payment’s date, its amount and reference number, and the name of the beneficiary, i.e. the online casino you have made the money transfer to. The support team of Entercash will be able to handle your complaint or issue more promptly when they have the above-specified information. Mobile gambling is a rapidly developing sector, so it makes sense for most players to pick a casino banking method that allows them to deposit and withdraw on their smartphones. 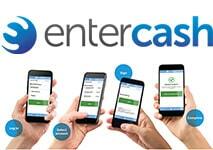 Entercash is one such solution since it is available across both channels, desktop and mobile. 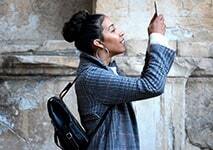 You can use the method on portable devices as long as your bank supports online banking on mobile. To conduct a deposit/withdrawal via Entercash as you go, you simply need to open your casino of choice on your smartphone. 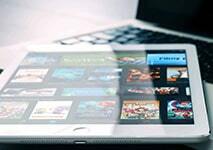 Some gambling operators accepting this method provide players with the option to install dedicated mobile applications. Others allow you to access their websites via in-browser apps. Either way, you must navigate to the mobile cashier of the casino where you again select Entercash from the available payment options and are transferred to the mobile banking portal of your bank where you confirm the payment’s details. At this point, readers might have already noticed what the benefits of using Entercash are but we shall summarize them nevertheless. 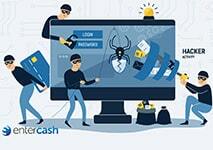 The biggest drawing attraction of Entercash has to do with the high levels of security it offers to online merchants (or casinos in this case) and their consumers. This is a trusted, well-regulated financial platform that operates under the licensing and supervision of the Malta Financial Services Authority. 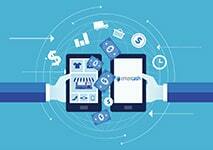 Additionally, Entercash offers a simplified, convenient and highly reliable payment experience to its users. Many casino players likely have previous experience with online banking and will not face any troubles when initiating deposits or withdrawals with Entercash. The method can be used by any casino player who holds an account with one of the banks within the Entercash network. The ability to make a casino deposit straight from your personal bank account is undoubtedly a big plus. Moreover, you can process your payments without the risk of identity thefts or other frauds. Entercash enables you to conduct your payments with full anonymity – there is no need to share your transaction details with anyone but your bank. Entercash is a very time-efficient solution for players whose hands are itching to make a bet. Deposits with the method take place in real time allowing you to start playing your favorite casino games for real money seconds after you have confirmed the transfer via your bank’s online banking platform. This method is also easy on one’s budget since most online casinos do not impose additional charges on Entercash payments. It helps prevent excess spending, too. Practically, you are using funds you already have in your bank account and are not allowed to pay on credit. This is the perfect solution for casino players who do not own credit or debit cards or are unwilling to use them for this purpose. As convenient and secure Entercash is, the method is not without its faults. One major flaw is availability. This payment solution is available only to players with accounts at the banks within the Entercash network. The bank needs to be based in one of the 18 countries the method is available in. This is likely to change in the near future since Entercash is constantly expanding to new markets and banks. Availability across gambling sites may prove to be yet another issue. Entercash is not as widely available as some popular banking methods like Skrill, Neteller, or Visa but we expect more online casinos to add it to their cashiers after the company penetrates other European markets. The method processes transactions in three currencies only. Players’ payments are settled in their local currencies which may cause them to incur extra costs for conversion if they are gambling at online casinos that do not work with said currency. And finally, the Entercash platform allows for a two-way flow of money but unfortunately, not all online casinos that accept the method for deposits support it for withdrawals. Some players who deposit with Entercash may end up looking for an alternative solution to cash out their winnings. Our suggestion is to get in touch with your casino’s support team and inquire whether Entercash can be used for withdrawals as well as for deposits. If it is not, it would probably be wiser of you to spare yourself the hassles and chose another supported banking solution. Our final verdict on Entercash is that it poses as a highly reliable payment solution, particularly for players who insist on quick and easy online casino deposits. The company complies with the financial regulations within the EU, which serves as a guarantee it is accepted by trusted gambling operators only. Entercash is a viable method of banking for casino players within major European markets and is particularly popular in Nordic countries like Sweden and Finland as well as in Baltic states like Estonia, Lithuania, and Latvia. Availability might be an issue for some players interested in using the method due to the fact one needs an account at a bank based in a country within the Entercash network. The good news is the Malta-based fintech company that operates the Entercash platform continually expands its reach to new markets and may soon arrive in the country you reside in. Even more so now when it is to be integrated under the Trustly brand. The bottom line is Entercash allows for convenient and super safe account-to-account money transfers, which reduces the costs of processing fees and greatly speeds up the transaction timeframes.